Posted by Jon in Mattel, MOTUC, Review with 0 comments. 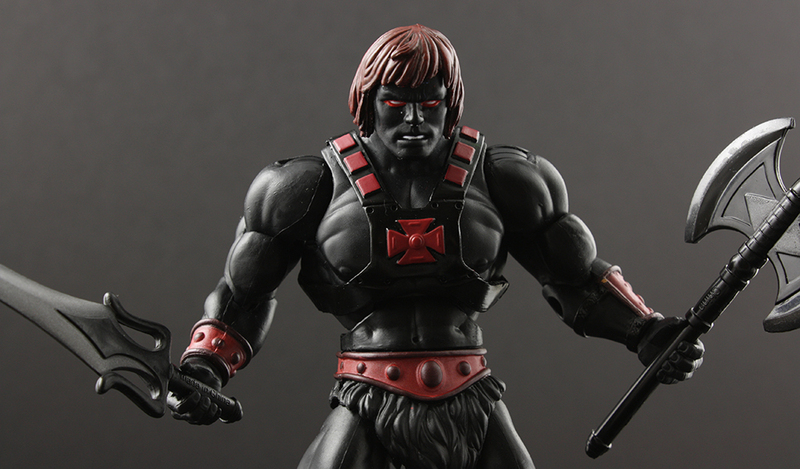 I’m a sucker for an all black evil palette swap, so naturally when Anti-Eternia He-Man was revealed I felt such a lust for revenge … WHO?! Until he was announced, I had no clue that this character was something that even existed. He originated from an audio show, eh? A German audio show. Okay now this is making a little more sense. Those Deutschlanders love themselves some He-Man; bless their German hearts and their affection for that man. He-Man? Nope, he isn’t! This almost doppelganger is the ruler of a dark mirror world called Anti-Eternia. Summoned by Skeletor via his World Converter, the evil interloper might just be the most dangerous threat to Eternia yet. Anti-Eternia He-Man comes with his evil power sword, shield, battle axe, and an additional sword and shield set. Anti-Eternia He-Man is going to be our “chase” figure for this year. A chase figure for a line you can only buy online? Yes, I understand it’s a really stupid concept. However, we’ve been doing it for three years now and I’m just about numb to it. Mattel at least did offer subscription holders a chance at the figure during early access last month. It sold out in a matter of minutes, but some of us (like me!) got through. The Mattel idea of an online chase figure is that Anti-Eternia He-Man will randomly show up on sale at Mattycollector for a short period of time throughout the year. Unfortunately the higher cost is already baked into the offering since he costs $30 as his base price before shipping. In the end, the absolute lowest price you will probably get this figure for is about $43 dollars since Mattycollector shipping and taxes ain’t cheap. But that’s part of the FUN of a chase figure! One of the exciting aspects of Anti-Eternia He-Man is the packaging. In Masters of the Universe Classics it isn’t often that we get packaging changes. Mattel decided to go with a black card motif to match the black He-Man encased inside of it. It looks great, but I’m well past the time in my life I’d buy a double of this figure to keep carded. That $30 price tag pretty much confirms I will only own one. If you are expecting some type of new tooling on this He-Man variant … well, I’m not sure what line you have been collecting these last eight years. He’s the MOTUC He-Man mold in black. You are getting exactly that. However, he does come with a healthy collection of accessories! The figure comes packed with black versions of the standard He-Man power sword, axe, and shield. In addition to the usual He-Man fare he also includes a black Alcala sword and Castle Grayskullman’s shield. While I enjoy the absurdity of an all-blue evil He-Man actually having the ability to fool people into thinking he’s the real thing, this all evil black He-Man is a real badass villain. The price is a little higher than I would have liked to pay, but the color scheme is so sharp and he has a great set of accessories that make the package a bit more worthwhile. He’s a gorgeous looking toy. As far as repaints go, he’s up there in obscurity and “cool” factor. As I mentioned prior, Anti-Eternia He-Man will be available random times through out the year. If you are feeling impatient give Amazon a try … but I have to warn you it won’t be cheap.